The daily timing of mammalian physiology is coordinated by circadian clocks throughout the body. Although measurements of clock gene expression indicate that these clocks in mice are normally in phase with each other, the situation in humans remains unclear. We used publicly available data from five studies, comprising over 1000 samples, to compare the phasing of circadian gene expression in human brain and human blood. Surprisingly, after controlling for age, clock gene expression in brain was phase-delayed by ~8.5 h relative to that of blood. We then examined clock gene expression in two additional human organs and in organs from nine other mammalian species, as well as in the suprachiasmatic nucleus (SCN). In most tissues outside the SCN, the expression of clock gene orthologs showed a phase difference of ~12 h between diurnal and nocturnal species. The exception to this pattern was human brain, whose phasing resembled that of the SCN. 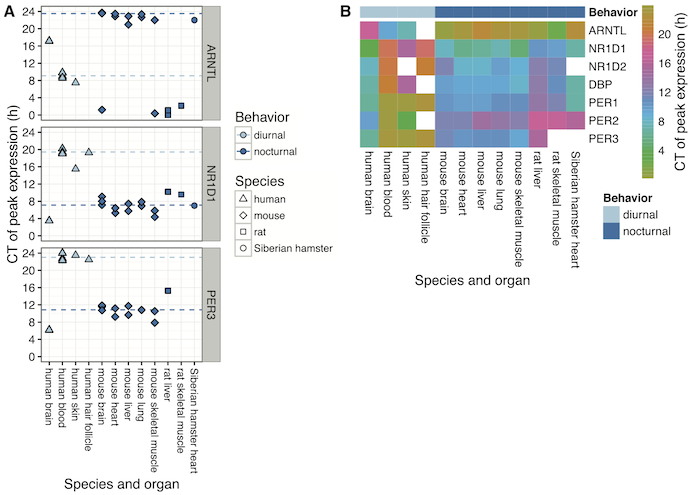 Our results highlight the value of a multi-tissue, multi-species meta-analysis, and have implications for our understanding of the human circadian system.